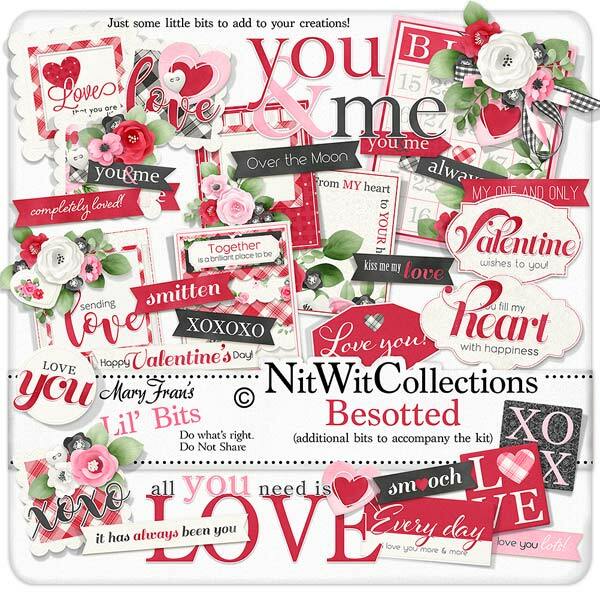 Lil' Bits "Besotted" adds so many additional clustered digital elements that it is sure to grab your attention! Mary Fran has thoughtfully designed each of these elements to give you the fun of simply placing them into your cards, mini albums and scrapbook pages and watching the gorgeous results come to life! Don't miss out on these digital elements as they are not included in the FQB "Besotted" Collection so please don't miss out on owning and creating with these elements! 1 Bingo card laden with flowers and loving sentiments...I think you've won!! 1 Journal card - "Together is a...."
1 Journal card - "From my Heart to Your Heart"....one of our favourite looks! 1 Label - "Everyday I Love You...."
1 Label in white - "Love You"
1 Sculpted label - "You Fill my Heart...."
1 Sculpted label - " Valentine Wishes to You"
1 Square black label with "X's and O's"
2 Sentiment digital stamps - "You & Me" one has a shadow left on it for a fuller effect in your creations, and one is without....you choose! 2 Sentiment digital stamps - "All You Need is Love"
1 Sentiment cluster - "Sending Love"